Megan	Glynn, Mnr Club Captain 2015. Hard luck to our ladies team who were defeated by a very strong Kilkerrin/Clonberne team in today's Connacht semi-final. You can all hold your heads high after another successful campaign, winning the Senior Championship and League double for the third consecutive year. Thanks to Ollie, Michael, Mick and Padraig for all their hard work throughout the season. A huge thanks to everyone who travelled to Clonbern today to support the team and for all your support throughout the year. Your continued support is much appreciated. Best wishes are extended to Eilish Fannon and Ciara Taylor who were unable to play due to illness and injury , we hope you both make a full recovery . Best of luck to our U 16 girls in their quarter final this Tueday evening at 8p.m. in Lisnamult against our neighbours Roscommpon Gaels . Congrats once again to Fiona Tully on her latest success on the handball court . She won the open doubles final in the All Ireland Colleges competition representing DCU and was runner up in the singles final. 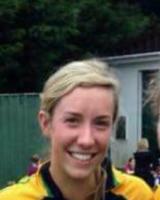 Finally best wishes to senior player Yvonne Creighton on her wedding day next Saturday . We wish yourself and Jack all the very best for your future together .